A revolution is stirring in America. People are angry at governments that spend more but deliver less, frustrated with bureaucracies that give them no control, and tired of politicians who raise taxes and cut services but fail to solve the problems we face. Reinventing Government is both a call to arms in the revolt against bureaucratic malaise and a guide to those who want to build something better. It shows that there is a third way: that the options are not simply liberal or conservative, but that our systems of governance can be fundamentally reframed; that a caring government can still function as efficiently and productively as the best-run businesses. Authors Osborne and Gaebler describe school districts that have used choice, empowerment, and competition to quadruple their students' performance; sanitation departments that have cut their costs in half and now beat the private sector in head-to-head competition; military commands that have slashed red tape, decentralized authority, and doubled the effectiveness of their troops. They describe a fundamental reinvention of government already underway--in part beneath the bright lights of Capitol Hill, but more often in the states and cities and school districts of America, where the real work of government goes on. From Phoenix to St. Paul, Washington, D.C. to Washington state, entrepreneurial public managers have discarded budget systems that encourage managers to waste money, scrapped civil service systems developed for the nineteenth century, and jettisoned bureaucracies built for the 1930s. They have replaced these industrial-age systems with more decentralized, more entrepreneurial, more responsive organizations designed for the rapidly changing, information-rich world of the 1990s.Osborne and Gaebler isolate and describe ten principles around which entrepreneurial public organizations are built. 10) solve problems by leveraging the marketplace, rather than simple creating public programs. 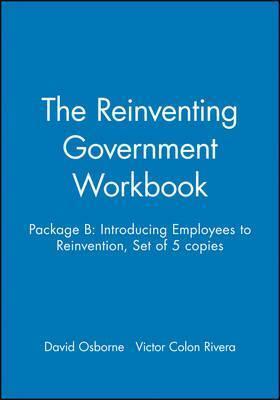 Reinventing Government is not a partisan book. It focuses not on what government should do, but on how government should work. As such, it has been embraced by both liberals and conservatives, Democrats and Republicans. DAVID OSBORNE is a managing partner of the Public Strategies Group, a consulting firm that helps public organizations develop and implement long-term change strategies. He is the author or co-author of three books: Banishing Bureaucracy: The Five Strategies For Reinventing Government, Reinventing Government, and Laboratories of Democracy. VICTOR COLON RIVERA is the founder and president of VCR-OI Consulting Group, Inc., and a partner of Outplacement International, Inc. He is a former southwestern regional human resource manager for Westinghouse Electric and director of personnel for the New York City Board of Education.